Making light of a light test. Dance is a skill I've always respected but never had the time or dexterity to obtain. This time of year especially makes me wish I had learned to dance. Movies like “White Christmas,” shows like “The Nutcracker,” all make me wish I could move across space gracefully. Luckily, I know others that can dance and dance well, and with a slow week before Christmas I called an old friend with an idea for a photoshoot. I had a rare few days of free time and a couple new Hensel Expert D 500's I wanted to try out. I needed a dancer and a little space. My friend had both ready by the end of the week. 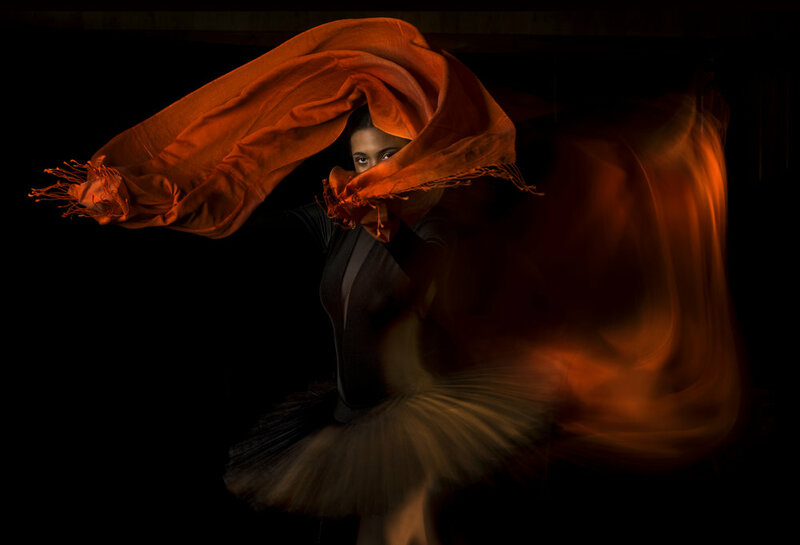 The idea was to photograph a dancer in motion. It’s a shot that has been done countless times by a plethora of photographers, but one I had never personally tried. I love the dreamy, fluid imagery others have created with a couple lights and an open shutter. To me it's a picture that perfectly captures the beauty of both arts - dance and photography - and I was excited to give it a try. The dancer, Jessica, is a high school senior who is applying to just about every art school in the northeast. The setup was fairly simple - a black background, two Hensel Expert D 500’s, a Grand Mini 85 parabolic softbox and a 9 inch sport reflector. The space was the backroom of my friend’s house, complete with a black cat - Bella - who kept disappearing into our background fabric and bolting at every flash of the strobe. The room was small for a photoshoot, but very workable. Part of what made a small space work was the Hensel strobes. They are lights I have learned to love over the last year. They are compact but strong, powerful but quick, and they have incredibly bright modeling lights. I admit that I don’t usually worry heavily about the strength of a modeling lamp (I’m usually more concerned with the strength of the strobe) but for this particular shoot it was important. To accomplish the effect I wanted, I needed a long exposure coupled with a continuous light on the subject to capture her motion across space. I didn’t have a stage with a spotlight, so I created a mini spotlight with the Hensel Expert D 500 modeling lamp and a 9 inch sport reflector. Jessica, in motion. I had one Hensel Expert D 500 with a 9 inch sport reflector setup as a spotlight behind Jessica. The main strobe - a Hensel D 500 with a Grand Mini 85 parabolic softbox - was setup to the front left of the subject. I placed the Expert D 500 with the sport reflector slightly behind where Jessica would start her move and pointed it directly toward the main light - the second Expert D 500 coupled with the Grand Mini 85 setup with the modeling light off and strobe on. The Grand Mini 85 is a new parabolic softbox that sets up easily like a beauty dish or umbrella, but that can be controlled and softened to create a delicate light. The box sets up easily like a beauty dish or umbrella, but has the control and delicacy of a parabolic softbox. For the camera, I had a Nikon D850 set on rear curtain sync with a 58mm lens on a Gitzo traveler tripod. Once the lights and camera were setup and working the way I wanted them to, I went through the look I was hoping for with Jessica. She did the rest. We spent roughly two hours trying different dance moves with different settings. Timing exactly when and how a dance move would start and finish proved difficult. To solve the timing problem, I put my Nikon D850 on Bulb. That allowed me to open and close the shutter at my command. I would press the shutter when she began to move, and close it as she hit her final pose. With the sync set to rear curtain the strobe fired as the shutter closed, giving the frame a clear, crisp finish. After playing with fluid motion for a while, we decided to try a stroboscopic look. We noticed, by accident while changing a setting on one of the Expert D 500s, that they fired incredibly quickly with almost no recycle time (usually a strobe has to power back up for a few milliseconds before firing again). I kept the camera in Bulb so I could open and close the shutter as I pleased, but set the light I was using as a spot - the Expert D 500 with the 9 inch sport reflector - on continuous fire. That created an image that showed Jessica’s various stages of movement. Instead of a fluid “swoosh” of color and light, we got little pieces that created the whole. It wasn't a shot I had planned on executing, but the Hensel's fire so quickly that creating a decent frame proved unexpectedly easy. Now, with a little more time and practice, it's a shot I'll try again.